Part Six of “Evil’s Might” brings forth the true villain, Hank Henshaw, better known as Cyborg Superman. He’s the one who’s infiltrated the Green Lantern Corps through the central power battery on Mogo, giving him access to individual power rings as they were charged, a nice analogy to computer hacking. The Ravagers have taken him as their leader, and in return, he promises to allow them full revenge on the Corps and the Guardians for past wrongs they feel they’ve been dealt. 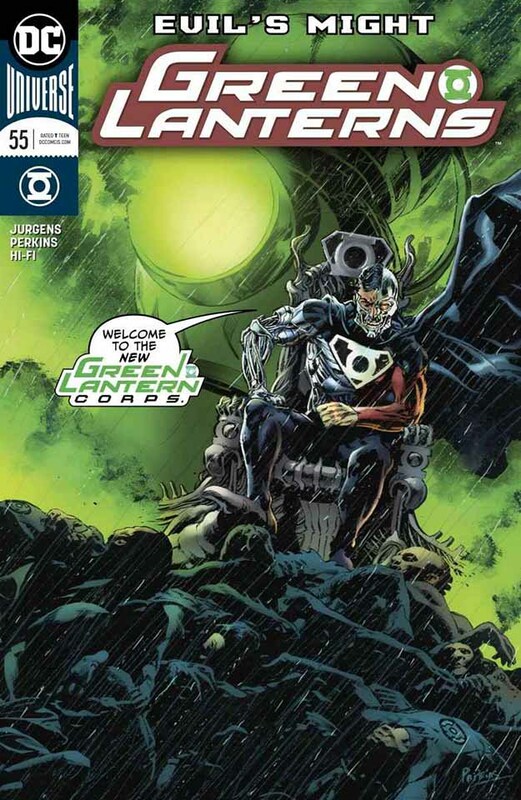 On Mogo and elsewhere, the green team is slow to realize what’s happening, why their communications system isn’t working, why one of their own, Simon Baz, took the most powerful ring of all, the Phantom Ring, and generally why everything in their world is going wrong. By the end of this issue, they will finally get it. But what can they do about it? That’s the real question. Great storyline, and I’ll bet writer Dan Jurgens is enjoying the return of his villainous creation! Recommended. This entry was posted in Comics, Reviews on October 26, 2018 by Todd.